Dist 24 1936-37 Teacher Helen Votipka. These are the names of those included in the photo. 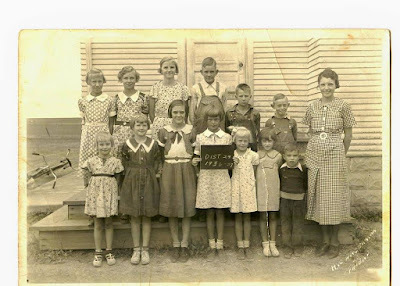 Spelling or order was not known: Elna Nelson, Shirley Johnson, Dorthy Nelson, Alma Nelson, Eva Nelson, Evelyn Krall, Reginald Koehn, Agnite Nelson, William Rachestraw, Margaret Nelson, Albert Kaiser, Darryl Couch.